A couple weekends ago, I had the chance to go see the film adaptation of Wonder by RJ Polacio – one of my all-time favorite books and one I’ve read every year with my fifth graders since it came out in 2012. And I am sure a lot of you also have a lot of love for this book. So, when I saw that my #BookVoyage friend, Julie Kirchner, had also seen the movie – I asked her to come on the show so we could chat about it. As you will hear, Julie is an amazing librarian and an all around amazing person and one of those people really worth connecting with Twitter. Alright – take a listen. In this section of the show, I share with you three books centered around a theme and discuss three things to love about each book. 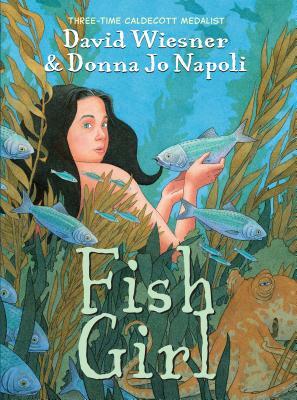 This week I want to share with you three brand new graphic novels with scifi /fantasy elements – Fish Girl by David Wiesner and Donna Jo Napoli, NewsPrints by Ru Xu, and Mighty Jack and the Goblin King by Ben Hatke. The simplicity and softness of the story. That isn’t to say that it doesn’t have depth or nuance, but I liked that the plot was quieter, easier to follow, and set mainly in the aquarium. And because the mermaid girl can’t speak, a lot of the emotion and backstory is conveyed in her expressions and gestures and in her internal thinking. I loved how the mermaid is portrayed and drawn. So – I’m always a little leery of mermaid depictions because they can tend to look sexualized with clamshell bras and such. But – it is always clear that Fish Girl is just that – a young girl. One who likes pizza and creating handmade jewelry for her new friend. I love the decision to keep her young. I just loved the other sea creatures who have become her family – how they protect and rally around her. Especially the orange octopus who has his own hidden talents. Plus – octopuses (octopi?) are just – amazing. And not the first time they’ve been a symbol of female empowerment and freedom. If you’re a fan of Mad Men, you know what I mean. Fish Girl is a beautiful graphic novel about breaking free from the limits others place on us, it’s about identity, and the power of friends to broaden our world and make us see things from a new perspective. I love the semi-steampunk setting with the inventor’s studio filled with, well – steam and parts of various flying machines and blueprints strewn everywhere. But then there’s this 1920’s flavor. I really, really love that blend. The birds! There’s this cute little yellow – canary? – called Goldie that flits around Blue and plays a part throughout the story. And the swirling, circling crows that inexplicably turn up at odd moments. The message this book has about the truth, about the the power of the news, and about our ethical obligations toward artificial intelligence. And if there even are any. 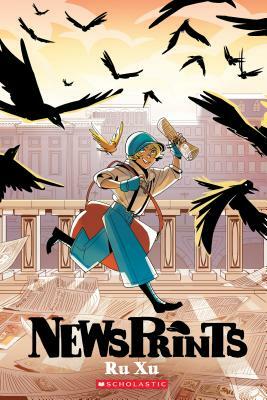 NewsPrints is gorgeous and if you know a child who liked The Nameless City or Compass South, this would be a great title to put in their hands next. 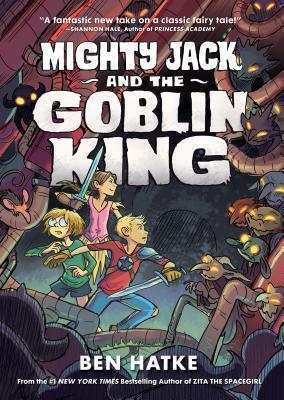 Our third graphic novel suggestion this week for those who love a fairy tale inspired fantasy is Mighty Jack and the Goblin King by Ben Hatke – the sequel to the must-read Mighty Jack. So, if you haven’t read that one yet – first of all – get on that. And second of all, I’m about to reveal a spoiler for the first book so…. you know, you might want to skip ahead a few seconds if that would bother you. Okay – Mighty Jack and the Goblin King begins with Jack and his friend Lilly in pursuit of the ogre that abducted Jack’s sister, Maddy, and carried her up the beanstalk into another realm. Now, I’ve read Jack and the Beanstalk so I thought I knew what they would discover in this other world. But, no…. completely and wonderfully different than what I was expecting! Here are three things to love about Mighty Jack and the Goblin King. Lilly’s story with the goblins. At the very beginning, she and Jack get separated and she ends up rescued(?) by a clan of goblins and on the brink an arranged marriage with their king. And the goblins are this weird mix of cute and gross and sweet and disconcerting. The magic eight ball and the old mustang that Lilly finds in the goblin’s junk heap. And how both of those objects come into play later on in the story. That surprise ending!! I finished this book in the waiting room of doctor’s office and I embarrassed myself by squeaking loudly when I got to that page. The Mighty Jack books have been a huge hit with my students and my kids. And I love them because they have depth paired with a lot of action and humor. So if you have kids who loved Amulet or Hilo – this would be a great series to introduce to them next. Our last segment this week is Question & Answer time. This question came up multiple times during my parent-teacher conferences last month and honestly – it’s my MOST asked question about reading. My child only wants to read graphic novels. How can I get them to read something else? Does that sound familiar to you? Well, first off – reading a graphic novel IS real reading. It’s less and less common every year, but I still sometimes hear parents and teachers and even librarians disparage graphic novels as not “counting” as “real” reading. Ugh!! I mean – really??? I wish I could hand them Nathan Hale’s Treaties, Trenches, Mud & Blood and SHOW them that graphic novels are not “cheating” – they add layers, they add complexity, they add context for really challenging concepts and vocabulary. Students are learning inferencing by interpreting the body language and facial expressions of characters…. Really, there is SO much complex thought happening when you read a graphic novel. (And honestly – I find the adults who are griping about them, haven’t read any.) And graphic novels lend themselves to being read over and over again because the first time, you are reading for plot and then you notice the interplay between the text and the images on further rereads. So – if your son or daughter is like mine and rereading Dog Man over and over – let them! And maybe ask them what new things they are seeing. Now, with that said, I do think it’s important to encourage everyone – including children – to read a variety of genres and formats. And developing the stamina and focus to read and comprehend longer chunks of text is a vital skill to have. So for kids who really love graphic novels, but would benefit from some practice with longer stretches of text, I do have some really great suggestions that still include illustrations and graphic elements but are more on the continuum toward a traditional chapter book or novel. Frazzled series by Booki Vivat – fantastic and funny realistic fiction books about a girl named Abbie Wu dealing with the tribulations of middle school. Tons of black and white drawings on each page and short chapters keep you turning those pages. I featured Book 1 on episode 8 if you want to know more, but I just finished Book 2 last week and loved it just as much. It’s called Frazzled: Ordinary Mishaps and Inevitable Catastrophes. Invisible Emmie by Terri Libenson is another great option that includes alternating chapters of comics and text. This is also a middle school story about fitting in and finding your place. There’s also Olga and the Smelly Thing from Nowhere by Elise Gravel. (And I think the sequel just came out.) I haven’t yet read this one myself but a lot of my heavy graphic novel readers are also picking this one up. Series like Timmy Failure, The Tapper Twins, The Terrible Two, or The House of Robots might be catch their fancy – they are funny and have lots of illustrations and graphic elements to break up the text a bit. Another option might be to hand them the full novel version of a graphic novel they already like. For example, my 5th graders are loving the new Baby-sitters Club graphic novels and were thrilled when I brought in the “old school” originals from Ann M. Martin. They didn’t know that there was a whole series of books out there. I was flabbergasted by that, but they’ve been out of print for awhile, so maybe I shouldn’t be surprised. Those are a few suggestions to tempt graphic novels readers. But – if they don’t bite. It’s okay. Just get them another graphic novel.